October 2016 News - Website of kennetaccordionorchestra! On a warm evening at the end of August the Orchestra played at the 21st. Birthday party for the daughter of Ronkey,one of the players in the Orchestra. 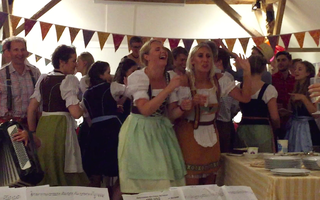 The theme was an Austrian evening and this was highlighted by colourful costumes and a good supply of Austrian style food. The young people sang and danced to our music which included ELO and Abba and many more. September saw the Orchestra make a return visit to The Holy Cross Church at Chiseldon,where we were given a very warm welcome by the audience. Nigel was challenged to play the bass part in Mr.Blue Sky which left Dodie to conduct! On the 1st.October we were invited to play at St. Andrew's Church Devizes. We were delighted to see how many people turned out in the pouring rain to come and listen to us. Nigel appeared as Freddie Mercury to conduct the final pieces which included a Queen compilation. October 10th. saw the Group travelling to Marden House,Calne to take part in the Calne Music and Arts Festival. Nigel chose a wide variety of music to hopefully change some peoples perception of the accordion.